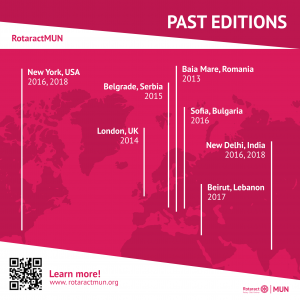 RGMUN Nepal is led by a team of motivated, determined and enthusiastic youths with leadership in their respective Rotaract Clubs and Rotaract District Committee, Rotary International District 3292, Nepal and Bhutan. Meanwhile, a separate group of individuals with profound knowledge of different areas of global issues will be leading the academic simulations and discussions that are to be conducted during the conference. Rotaract in Nepal started with the Charter of Rotaract Club of Birgunj in 1991 but has been active and effective only since 1998. With continuous efforts and exercises of positive leadership now it has a strong networking district committee set up to facilitate clubs in their activities all over Nepal. Rotaract movement in Nepal was initially a part of Rotary International District 3290 which was composed of Rotaract Clubs of West Bengal and Andaman and Nicobar Island. From Rotary Year 2007-2008, with around 50 Rotaract Clubs, RI District 3292 started under the leadership of Mr. Rajan Piya. Clubs under RI District 3292 are spread all over Nepal with Bhutan also a part of it. Continuously recognized as one of the vibrant districts with active membership of over 3000 Rotaractors in 126 Rotaract Clubs, the value of Rotaract has been strongly growing as we have been able to mark our presence in local communities as well as in international arenas. The Rotaract District Committee, comprising of representatives from clubs across the nation, is delighted to present this proposal to host the 2019 edition of Rotaract Global Model United Nations. Apart from the vibrant discussion on the most pressing issues of today`s world, Nepal Offers a unique experience to people. The unique culture, diverse ecology and natural beauty is something that Nepal is famous for. The adrenaline factors such as trekking, rafting, bungee make Nepal a go-to destination among the adventure enthusiasts. As Pokhara caters the unique exposure of both beauty and culture at the same time, RGMUN Nepal is an event to watch out for. The city offers a unique opportunity to explore nature, hospitality and mind-boggling food at the same time. As a doorway to one of the longest trekking circuits “ Anna Purna Circuit, “ the mountains are waiting to welcome the delegates to a unique experience of participating in discussion with pleasant nature and hospitable people. Hotel Jal Mahal is a boutique resort in Pokhara where water, mountains, plants and humans interplay to rejuvenate each other. It is a resort with luxurious poolside rooms, stunning Himalayan views, beautifully maintained spacious garden, and warm hospitality. It is the only resort in Nepal providing privileged access to the child-guests to a boutique theme park, run by its sister concern, ChaChaWhee. 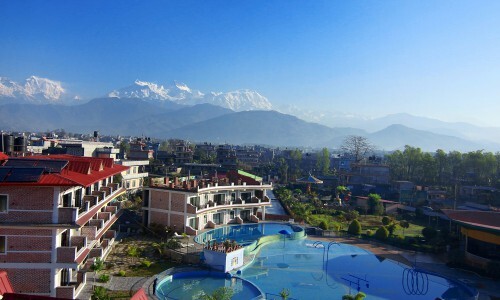 The Infinity Deep Pool, Family Splash Pool and Kids Pool form the largest hotel pool complex in Pokhara. These pools are where guests can refresh during the day, relish the reflections of the Himalayas during sunrise and sunset, and photograph the colorful hotel reflections in quiet evenings.